Lenny is just an amazing, wonderful, special puppy! He is super happy and friendly, and loves to meet people! I had a friend stop over, and he was just so happy to have another person to love on! He puts his paws on your legs and leans in for loving. He also loves to be held and he gives kisses! Then he’s raring to get down from my lap and pounce on a wide range of toys and play! 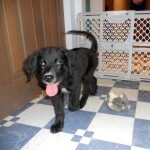 He really has a very sweet personality – a great combination of Lab and Pyr, though definitely acts more Lab than Pyr (so outgoing, so affectionate, so playful)!. He loves my 5 year-old grandson. My grandson just giggled and giggled the whole time that Lenny tried to play with him. Lenny would sit on him, lick him, jump on him, all with great affection and joy, and my grandson thought it was the best! He’s interested in everything I do, interested in the cats when they go into the kitchen, etc. but he’s also happy to lay down and rest. When he came from the shelter a week or so ago, he was skinny and had low energy. Now that he is getting good food (and putting on weight which is wonderful), he has normal happy puppy energy which he uses up after romping and chasing the toys I’m tossing around! After a good fun play session, he loves being held and rubbed, and then he’s ready for a rest. When I hold him, he gives me kisses and just relaxes in my arms. It’s wonderful to see. He barks only when he’s in his crate and is hungry…, once he gets his food he is happy and then plays hard for 20-30 minutes. Then he settles down and is quiet for many hours because he’s resting and snoozing or playing with his toys in the crate. While his barking is minimal he makes a bunch of other really cool sounds like he’s trying to talk to me! It sounds sort of like a cross between grunts and croons and groans –it’s utterly adorable! I wish I understood what he was saying! 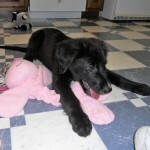 He doesn’t bark at all when he’s out of the crate, but is a funny, “wild man” puppy carrying on with his toys. He loves jumping into the shopping bag where I keep all the toys! He has the natural puppy “chewing” thing, so I give him plenty of teething toys, and when he tried chewing on my hand, I told him “no”, and he went back to jumping on his toys like a good boy! I have cats and my oldest one, Nick goes right up to his crate. Lenny tries to talk to the cats when they come into the kitchen because he wants to get out to play – but he doesn’t bark. His tail is always happy wagging! He stands in the utility tub and lets me wash him – although he does try to get out at first. Once he’s wet and soaped up, he loves being rubbed, rinsed, and fluffed up with dry towels and he’s ready to play some more!. 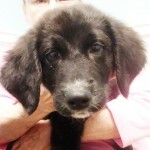 He has soft fluffy Pyr fur which is mostly black like a Lab, but he has white fur on his chest and the tips of his paws and he has a single dew claw on the back legs. Lenny is looking for a wonderful adoptive home in central NY because he heard that the homes up here are the best in the nation! He would have so much fun in a home with another playful dog, but would also be fine as an only dog if he got play dates and maybe some doggy daycare to keep up his terrific dog socialization! If you are interested in applying to adopt Lenny, please fill out an online adoption application and live close to Ithaca , Syracuse, Binghamton, Rochester, or Elmira. We do home visits on every applicant, and can’t do home visits where we don’t have local volunteers. 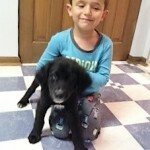 good with cats, good with dogs, good with kids, Great Pyrenees, Lab mix, large, male, puppy, small, young. Bookmark.